Who are the Knights of Saint Andrew? 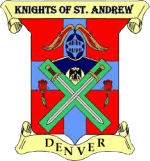 The Knights of Saint Andrew (KSA) is an organization within the Scottish Rite limited only to "black hat" 32° Scottish Rite Masons. Our purpose is to serve our Consistory in any way called upon and to give 32° members a way to get involved and broaden their Scottish Rite experience. Knights are designated by a tartan sash worn at all Scottish Rite functions. Many Knights choose to wear kilts, though they are not a uniform and not required. There is a one time fee of $75 to join, and all new members are Knighted in a ceremony held two to four times a year. If you are a member of the Denver Scottish Rite and are interested in joining the KSA, please complete the application for membership. A group of Knights, accompanied by other Brothers and guests, regularly gather at a local establishment after each KSA Chapter meeting and stated Consistory meetings. All are welcome to join us in Harmony. Questions? We're here to help! Feel free to write, email, or visit us on Facebook.